Taylor Levy and Hector Ruiz, who were working at the border to provide legal assistance to asylum seekers, were not included on CBP’s list of 59 reporters, organizers, and perceived “instigators” in the San Diego area—but both were stopped at the border in recent months and subjected to questioning and forced to hand over their cell phones to agents. “I was treated like a criminal,” Ruiz told NBC of his experience being stopped by a group of agents as he was crossing the border near Juarez, Mexico. Ruiz was asked about his political beliefs during a four-hour detention at a CBP station which continued until he agreed to allow the agents to look through his cell phone contacts. “They asked me what my opinion was on the administration, just generally. And how we are doing economically,” Ruiz told NBC. 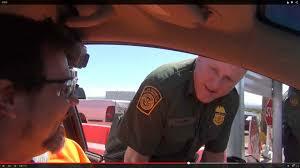 Weeks later, Levy was stopped in her car when she was attempting to cross into El Paso. She was held for two hours in a station and told that she would be arrested if she didn’t answer the CBP agents’ questions. Here are stories from more immigration lawyers and journalists targeted for questioning at the U.S. border with Mexico. As Common Dreams reported last year, a change in the Immigration and Nationality Act more that 70 years ago resulted in a 100-mile zone near all U.S. borders—where 200 million people live—in which Americans officially do not have constitutional rights protecting them from warrantless searches and demands by CBP agents. The U.S. Supreme Court has repeatedly held up the rule over the objections of the ACLU and other rights groups. The ruling has resulted in incidents like Levy’s and Ruiz’s detentions, as well as those of a documentary filmmaker and two other lawyers. Esha Bhandari, an attorney with the ACLU, rejected the notion that the CBP can legally seize reporters’ and lawyers’ phones and detain them without cause within the 100-mile zone. “The government cannot use the pretext of the border to target and punish activists critical of its policies, lawyers providing legal representation, or journalists simply doing their jobs. Whether near the border or not, it’s a First Amendment violation and there’s nothing complicated about that,” Bhandari told NBC.